Lawyer sues former Ukrainian president over gas contracts with Russia | Russian Legal Information Agency (RAPSI). KIEV, June 25 (RAPSI) - Lawyer Stanislav Batryn has filed a lawsuit against former Ukrainian President Viktor Yushchenko, demanding that the High Administrative Court of Ukraine recognize the former president's actions during the gas conflict with Russia in late 2008 and early 2009 as unlawful, Ukrainskaya Pravda reports on Tuesday, citing the plaintiff. Earlier, Batryn appealed to the government and the State Property Fund to invalidate the gas supply contracts signed by Naftogaz and Gazprom on January 19, 2009. The Kiev District Administrative Court opened proceedings in the case in April. The lawyer noted in his new lawsuit that Yushchenko misappropriated the government's powers to influence Naftogaz during the signing of gas supply and transit contracts with Russia. "...We are challenging the legality of the president's decision to prohibit Oleh Dubyna, the head of Naftogaz Ukraine, from signing gas contracts at a price of $235 (per 1,000 square meters)," the newspaper reported, citing Batryn. 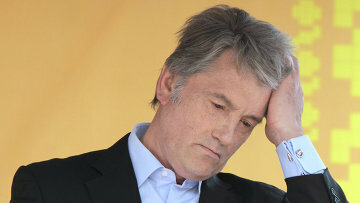 The Our Ukraine party, which is led by Yushchenko, said the lawsuit is "an ignorant expression of the opposition's obsessive striving to abandon responsibility for the consequences of the gas contracts with Russia." Ukraine and Russia were negotiating gas supplies to Kiev and gas transit to Europe via Ukraine in late December 2008, but failed to come to an agreement. In January 2009, Russia suspended gas supplies to Ukraine due to the absence of a new contract and subsequently also stopped gas transit to Europe. The conflict ended with the signing of contracts on January 19, 2009 in Moscow. In October 2011, a Kiev district court sentenced former Prime Minister Yulia Tymoshenko to seven years in prison for abuse of power in signing gas contracts between Naftogaz and Gazprom in 2009. 18:19 25/06/2013 Lawyer Stanislav Batryn has filed a lawsuit against former Ukrainian President Viktor Yushchenko, demanding that the High Administrative Court of Ukraine recognize the former president's actions during the gas conflict with Russia in late 2008 and early 2009 as unlawful, Ukrainskaya Pravda reports on Tuesday.